Patrick Kane scored his third goal of the game 11:40 into the second overtime period and the Chicago Blackhawks beat the defending champion Los Angeles Kings 4-3 to advance to the Stanley Cup finals on Saturday night. 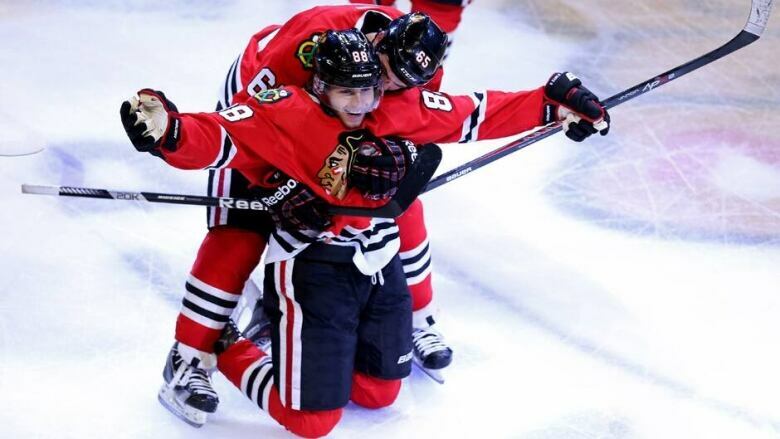 Patrick Kane, front, is greeted by teammate Andrew Shaw (65) after scoring in double over time to send the Chicago Blackhawks into the Stanley Cup final Saturday night. Patrick Kane skated toward the middle of the ice, dropped to his knees and pumped his right arm, surrounded by a sea of red jumping up and down in waves. The hats began to come down as the Chicago Blackhawks rushed in to celebrate another trip to the Stanley Cup finals. It was an emphatic checkmate at the end of a long night. The Los Angeles Kings' NHL reign is over. Kane scored his third goal of the game 11:40 into the second overtime period and the Blackhawks beat the defending champion Kings 4-3 on Saturday to advance to the finals. "Right now I think it's almost like I'm in a different zone, like in the Twilight Zone or something," Kane said, calling it the best game of his career. "I'm kind of out of it. It's definitely a good feeling, though." Corey Crawford made 33 saves, and Duncan Keith scored in his return from a one-game suspension as the top-seeded Blackhawks eliminated the Kings in five games in the Western Conference finals. Chicago will host the Eastern champion Boston Bruins in Game 1 of the best-of-seven championship series on Wednesday night. Boston completed a sweep of the Pittsburgh Penguins on Friday night. "It's a special couple places. The tradition of the Bruins and the Hawks is special," Chicago coach Joel Quenneville said. "I'm sure, you know, the rivalry could return instantly come Game 1. I think it's good for the league. It's good for hockey. Two great hockey markets. We're very excited to be a part of it." This is the first finals matchup of NHL Original Six franchises since 1979, and it will pit two of the last three champions against each other. "Every series presents its challenges," forward Patrick Sharp said. "Watching Boston, they're rolling right now. Another tough series ahead of us." Los Angeles managed to recover after trailing 2-0 in the first period and 3-2 late in regulation in the longest game in franchise history. Mike Richards and Anze Kopitar both had a goal and an assist, and Jonathan Quick finished with 31 saves. "We got beat in the conference finals by the best team in the conference at the end of the day," Kings coach Darryl Sutter said. "We accomplished everything. Once you set the bar up there, then that's your bar. So obviously we're disappointed to lose to Chicago, but we're certainly not disappointed in how we played." Kane was in the middle of a quiet post-season when he finished off Bryan Bickell's shot for his third playoff goal in Chicago's 3-2 win in Los Angeles on Thursday. The talented forward yelled in relief after that goal and came up with his best performance of the playoffs in Game 5. After Crawford made a couple of big saves in the first overtime, Jonathan Toews carried the puck up the left side during a 2-on-1 rush in the second extra session. He then made a cross-ice pass to Kane, who one-timed a shot past Quick and into the right side. "You know, the shift before, actually Jonny had the same play, and the puck fumbled on him," Kane said. "I knew he was coming back to me. Just tried to wait for the defenceman to go by me. Tried to get it off as quick as I could in the net." The rollicking sellout crowd of 22,237 erupted in joy as Kane started the celebration for the Blackhawks. A distraught Quick remained face down on the ice as his teammates emptied the bench for the post-series handshakes. Chicago was poised to finish off Los Angeles in regulation when the Kings scored the tying goal with 9.4 seconds remaining. Kopitar took a long shot from the right side and Richards managed to tip it by Crawford, leading to a celebration for the Kings while the crowd groaned in disbelief. "So emotional," Kane said of the lost lead. "You start thinking about it when it goes to 14 seconds away from going to the final. It stuck with us for the first overtime. It was nice to close it out for sure." It was Richards' first game since he took a big hit from Chicago's Dave Bolland in the series opener, shelving the centre with a suspected concussion. "We played well in the second and third and even overtime. I think we had a lot of chances," Richards said. "But give them credit, they played well, and their goaltender made some big saves." Crawford used his glove to deny Williams and Jake Muzzin in rapid succession midway through the first overtime. Bickell had an opportunity to end the game at the other end, but he was unable to corral Kane's pass on a rush to the net. The lost lead at the end of regulation turned into a minor inconvenience for the Blackhawks when Kane finished his second career post-season hat trick. Los Angeles' rally began when Williams made a strong charge up the left side and set up Dwight King's short-handed goal at 9:28 of the second. The Kings tied it 2-2 when Kopitar pushed a rebound through Crawford's legs 3 1/2 minutes into the third. It was Kopitar's first point of the series and he snapped a six-game goal drought. It also was the third power-play goal allowed by the Blackhawks in 58 playoff chances. The tie held until the Blackhawks took advantage of a bad break for the Kings to go in front again. Williams had the puck behind the net when he fell, and Bickell made a slick pass to Kane, who beat Quick to give the Blackhawks a 3-2 lead with 3:52 remaining. Keith missed Chicago's 3-2 win in Los Angeles on Thursday night after he was suspended for high-sticking Jeff Carter in the face in Game 3, opening a 20-stitch gash on the face of the star forward. The defenceman said it was an accident, and he was very pleased after the Blackhawks won Game 4 without him. Back on the ice Saturday, Keith wasted little time in announcing his presence. With the Kings in the middle of a line change, Keith got a pass from Michal Rozsival on the left side of the ice, skated in, and fired a long slap shot through Quick's legs at 3:42 for his second goal of the post-season. The Blackhawks kept up the pressure as the Kings struggled to hold on to the puck, and a little patience by Kane led to a 2-0 lead just six minutes in. He waited while a scrum in front of the net took out Quick, and then put a shot over the prone goalie.